Submitting yourselves to enter within the fire. 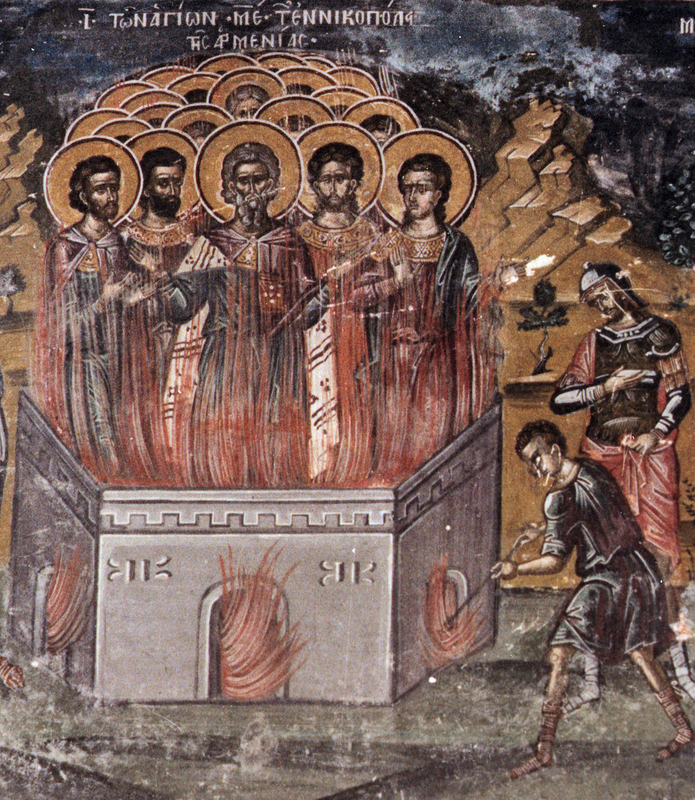 On the tenth very mighty Nicopolitans were slain in fire. The Holy Forty-five Martyrs of the Armenian City of Nicopolis suffered during the reign of the emperor Licinius (311-324), then a co-regent with Constantine the Great. Licinius, the ruler of the Eastern Empire, fiercely persecuted Christians and issued an edict to put to death any Christian who would not return to paganism. When the persecutions began at Nicopolis, more than forty of the persecuted of Christ decided to appear voluntarily before their persecutors, to confess openly their faith in the Son of God and accept martyrdom. 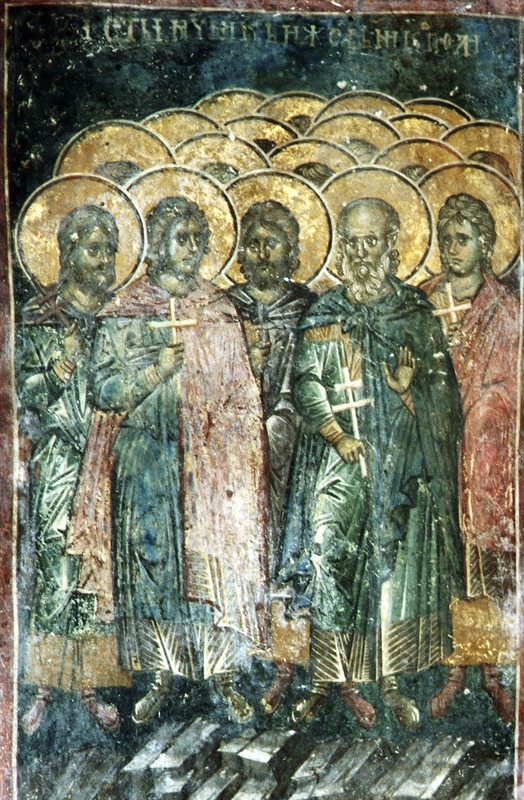 The holy Confessors were headed by Leontios, Maurikios, Daniel, Anthony and Alexander, and were distinguished by their virtuous life. The procurator of the Armenian district, Lycius, before whom the holy Confessors presented themselves, was amazed at the directness and bravery of those who voluntarily doomed themselves to torture and death. He tried to persuade them to renounce Christ and offer sacrifice to the pagan gods, but the Saints remained steadfast. "And where is your Christ?" Lycius asked. "Was He not crucified and did He not die?" To that Leontios replied: "Since you know that our Christ died, know also that He resurrected from the dead and ascended into heaven." They refuted all the arguments of the governor, pointing out to him all the falseness of faith in the vile and vice-filled pagan gods, leading those that worship them to ruin. After a lengthy discussion about the faith, Lycius had them scourged and thrown into prison and gave them neither food nor drink. Vlassina, a benevolent Christian woman brought them water and handed it to them through the window of the prison. In prison the Saints rejoiced and sang the Psalms of David. Saint Leontios inspired and encouraged the brethren, preparing them to accept new tortures for the love of Christ, and telling them of the bravery of all those formerly that had suffered for Christ. In the morning, after repeated refusals to offer sacrifice to the idols, the Saints were again given over to torture. Saint Leontios, seeing the intense suffering of the Martyrs and worrying that some of them might falter and lose faith, prayed to God that there might be a quick end of the matter for all. When the holy Martyrs sang Psalms at midnight, an Angel of the Lord suddenly appeared to them, and the prison blazed with light. The Angel declared to the Martyrs that their contest was near its end, and their names already were inscribed in Book of Life. Two of the prison guards, Meneus and Virilad, saw what was happening and believed in Christ, thus bringing their total number to forty-five. On the following morning, the governor decided to put the Martyrs of Christ to death. After severing their arms and feet with an axe, they were cast in a furnace of fire, and threw their bones in a river. This horrible two-fold punishment was carried out and the souls of the Holy Martyrs took flight to their Lord entering into eternal life. Pious Christians found the relics, gathered them up and saved them. Later on, when freedom had been bestowed to the Church of Christ, a church was built on this spot in the name of the Holy Forty-five Martyrs. 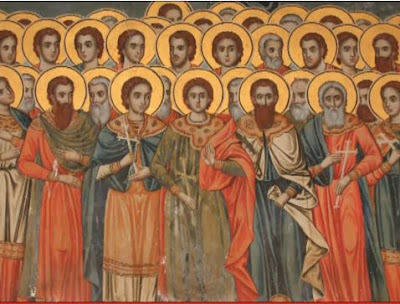 You were chosen from on high as an army of sacred ranks, O Forty-five Martyrs of Christ. You contested for the glory of Christ, and by your struggle defeated polytheism. We glorify Him Who has glorified you. You endured many torments for the sake of Christ, O Martyrs. You destroyed idolatrous polytheism and godless error by Christ's power. Teach us all to cry with faith: Alleluia.